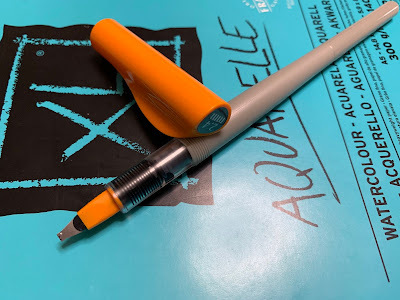 Are you particular about pens? Honestly, I don't pay much attention to select art supplies in general and I mostly draw with a fine liner or ballpoint pen available everywhere. But lately I found a pen, THE pen, which works just right for me. It's a Pilot parallel pen with a 2.4 mm nib. 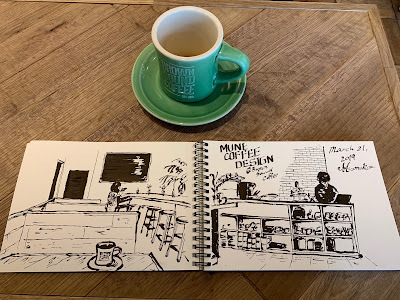 I've been drawing with it quite a lot recently, so here I'm gonna be sharing my parallel pen sketches and a story behind. 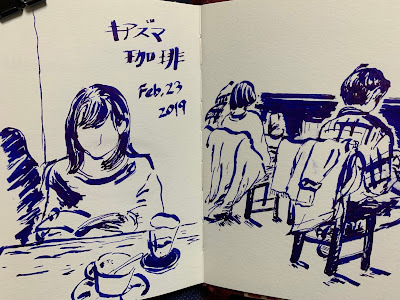 I tried a parallel pen for the first time when I sketched with Samantha in Osaka and borrowed hers last month. My drawing was messy since I couldn't control the nib at all. But I fell in love with how the lines went unpredictable and spontaneous and decided to buy one after coming back to Tokyo. Then I got one from Sekaido and tried drawing with it. I knew I couldn't control the lines, so I even didn't try to. As I was using the pen, I realized it makes it much easier to grasp the general shape and movement of an object with one stroke than a fine liner because it provides thick lines. It enables me to draw faster, draw much in a shorter time. That brings me fun. 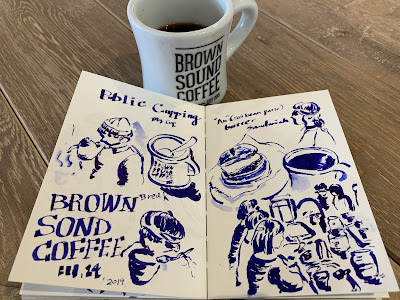 With this new mate, I tried to make a sketch report of a coffee cupping event. It was very hard to fill in a spread following the movements of the barista brewing coffee one after another and the people walking around to try out different coffees. I couldn't care at all about the scale or composition. 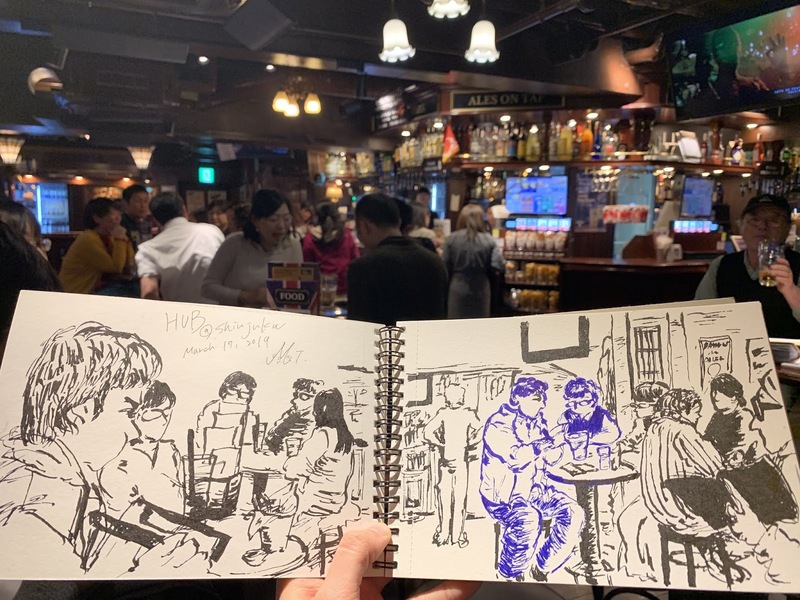 But I think I managed to capture the atmosphere of the place and the things I saw and experienced and the sketch is packed with liveliness. In general, I think too much before doing something, which often makes me end up running out of time or even not knowing what I intend to do. Probably I'm too cautious. 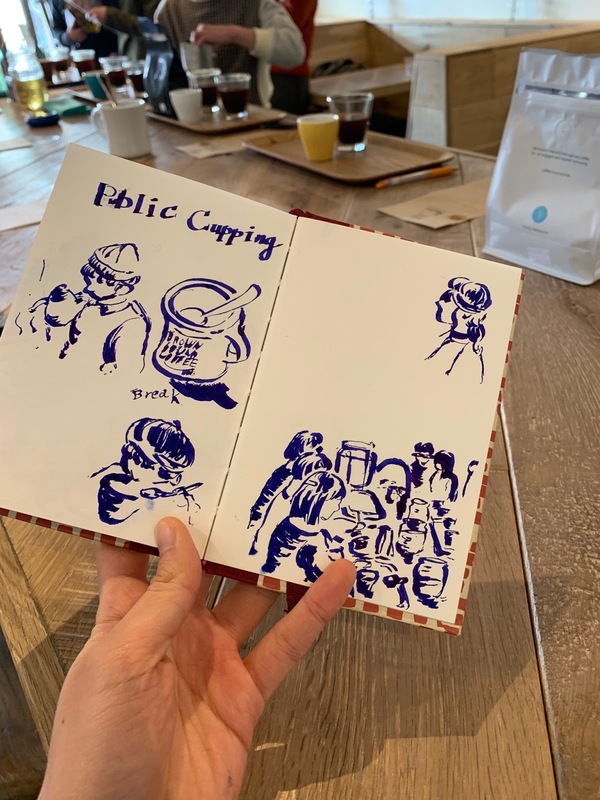 But, when using a parallel pen, I don't try to control the flow of lines or take much care for the composition or details because I know I can't. And interestingly, that makes me bolder, more confident to draw. 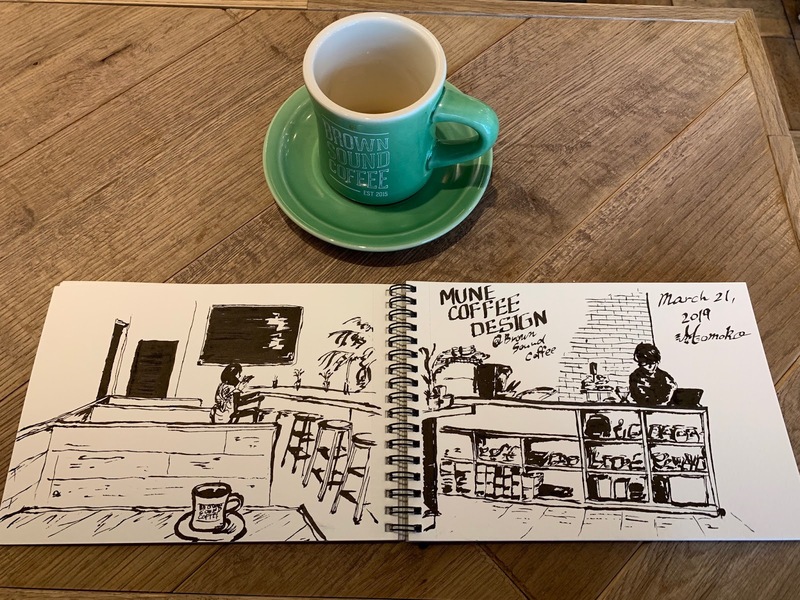 Once I get started, I draw quickly without concern and a spread is filled before I realize it. That gives my sketch liveliness. 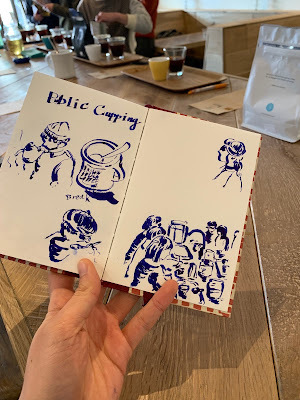 This way, a parallel pen works very well with my style to record an atmosphere people create, a shared time and place. 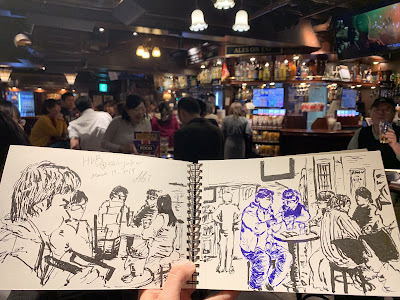 That's why I was very excited to draw with a parallel pen in a drink & draw session (it's exactly where the pen would shine). 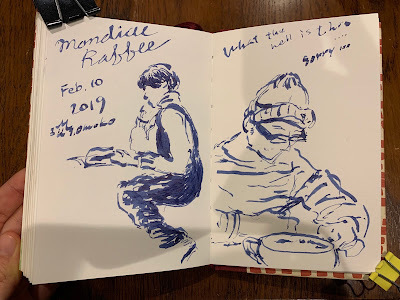 For the last monthly USkJ meet-up, we had a drink & draw at HUB again and I started to sketch with my buddy. But after a few minutes, it ran out of ink. I borrowed Shin-san's with black ink and drew 90% with his. I feel like I always borrow something from someone... Anyway, here is my sketch. The accident gave a good contrast between black and blue. I love blue. But I found black is also cool and started to use black ink this time. Here is my latest sketch. I like the result. It's relaxed. So this is a story about a pen I've been loving recently. What pen do you use? I'd love to hear your stories. The comment box of this blog hasn't worked properly for a while, so you can share them on Facebook (I have shared this post on FB). Hi, I'm Momoko. I like sharing experiences, ideas, insights etc. both in drawing and writing forms.